Ordinary guys head to the gym to get the satisfaction of throwing a few weights around. They pick their favorite machines and weights, they do lots of reps and sets to brag about their numbers, and they do the same thing day in and day out. However, you don’t want to be just an ordinary guy. You want to be the Incredible Hulk, a sculpted god of muscle and strength, the epitome of endurance and performance. If you truly want to get bigger, stronger muscles, then you’re going to need a surefire game plan, not a dusty old routine written by weekend warriors. There are better, faster ways to get the streamlined look you’ve always wanted. Mark Philippi, former America’s Strongest Man explains, “You need to find new ways to stimulate your body to boost your strength,” and these exercise tips will help you dominate your gym time and push through ordinary workout plateaus. It doesn’t take a genius to know that if you want bigger, stronger muscles, then you’re going to need to lift heavier weights. When you first started out exercising, did you ever notice that you could gain size and strength with pretty much any exercise as long as you kept with 15-20 reps? However, the more you exercise, the more your body adapts – which means that those 15-20 reps at your usual weight won’t have the same effect it did a few weeks ago. You’ll need to bump up your weights and consistently challenge yourself to maximize your muscle gains. For example, if you want to challenge yourself at the bench press but can’t even push the bar off your chest, then eccentric lifting may be just what you need to build bigger muscle. 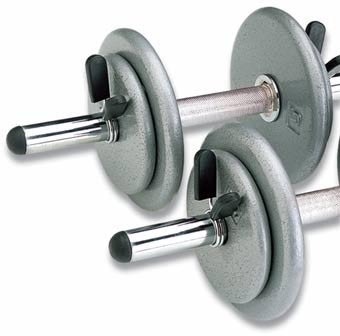 Experts recommend that you load your barbell with 80-120% of your 1-rep max and then take 4-5 seconds to lower the bar. Use your spotter to help push the bench press back up as fast as possible. It may surprise you to discover that your body can handle more weight when you’re lowering the bar than pushing it back up. The slow lowering motion can help train muscles to handle a heavier load, forcing your body to adapt. Proper form is essential for sculpting the perfect body and avoiding personal injury. Deliberate, controlled motions are critical for each and every repetition and set you do. However, if you’re an advanced weight lifter and athlete and are struggling to see any muscle gains without hurting yourself on the heavier weights, then adding a little extra speed to your workout may be just the boost you need to bulk up. Fast lifts trigger utilize more muscle fibers than slow lifts, which increases the body’s potential to grow. It increases your heart rate and supercharges your metabolism for better results overall. Understanding your body’s limits is essential for pushing past them. If you’re exercising properly and following good form, then you’d probably notice how your body starts to cheat or your pace starts to slow when you’re pushing yourself to the very edge. Spanish researchers, however, have shown that weight lifters who train until they can’t complete a repetition have smaller gains in strength and performance than those who keep a bit of their strength and energy levels in reserve. For example, if you want to do a workout that requires 5 sets of 5 reps, but can only maintain good form for 4 of reps out in each set, then add an additional set to your workout later in your workout to hit your goal but still stay within your limits. These exercise tips are a great way to make the most out of each and every workout. On the other hand, don’t forget that what you do in between workout sessions is equally important for sculpting muscles and bulking up. For more information on how to make the most of your muscle recovery time, read this article here.